King Krabs – From SpongePedia, the biggest SpongeBob-wiki in the world! King Krabs is the royal ancestor of Mr. Krabs. He first appeared in Dunces and Dragons. He looks like Mr. Krabs but he has a nice coat and looks more expensive and he has a nice crown. He was thought by Squidly to be a bad leader and not doing anything about Planktonamor. When Planktonamor was defeated, during the celebration King Krabs invented the Krabby Patty. It is likely that King Neptune was the new ruler after Krabs died. 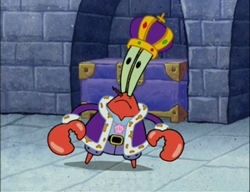 King Krabs looks like Mr. Krabs but he has an expensive purple coat, and a huge, matching crown. He has a staff with the letters, "KK", on the top. His name is a pun on a crab called a King Crab. This page was last modified on 3 April 2018, at 21:52.